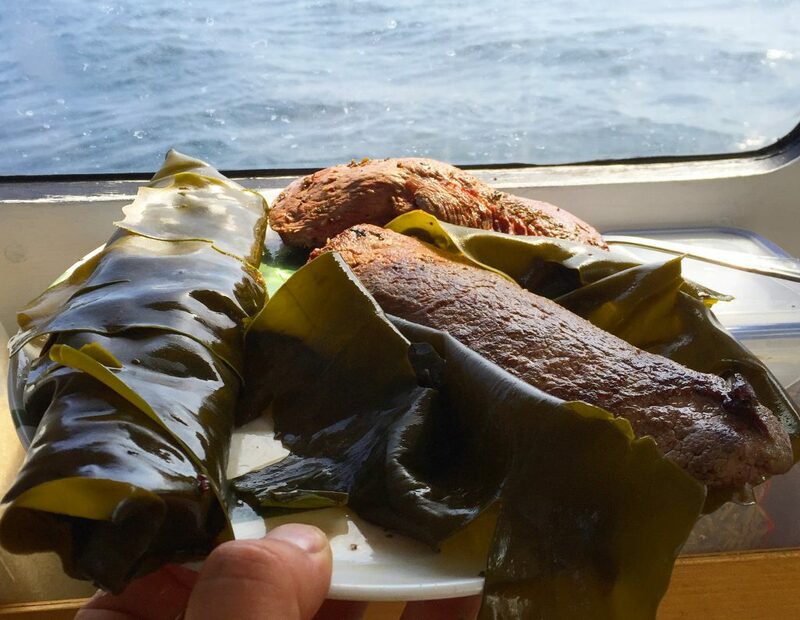 Sous Mer cooking – these fillets were actually roasted in seaweed below sea level – in the galley of a catamaran! Some seaweeds are excellent for what I call sous mer or sous weed cooking. Large, thick-bladed species such as oarweed, forest kelp, sugar kelp and dabberlocks are particularly suitable for this technique, but thinner species such as laver or sea lettuce can also give excellent results. Wracks can also work well in outdoor ovens, though they tend not to seal their contents very well. I get a little troubled by the excess of sous vide cooking in modern gastronomy. Sous vide translates directly to “under vacuum” and while I realise it allows chefs to achieve a consistency, precision and succulence in their cooking, I wonder if we really want so much of our food to be swaddled in plastic? Wrap (all, or fillets of) fish , chicken, venison, beef or hefty vegetables like celeriac, as tightly as possible in sheets of fresh or rehydrated seaweed. This is a chance to use up those huge, thick, flannel-like sheets of kelp that aren’t so great for other things. Roast in the oven or even better over a fire or BBQ. The protection afforded by the seaweed allows you to cook at a lower temperature and for longer, without the contents drying out, or on a fiercer flame without burning your meat. Thick kelp in particular not only keeps the contents moist and locks in flavour, but also seasons and adds umami, so you can adjust your seasoning accordingly. Once cooked to your liking , the seaweed can be removed and the contents seared briefly to caramelise. Ya – boo to wrapping everything in plastic! I’m grateful to the lovely Roushanna Gray who does fab things with wild ingredients in South Africa (and on Islay when I met her! ), for inspiring me to explore more deeply this technique that has long been used in bush-cookery around the world. 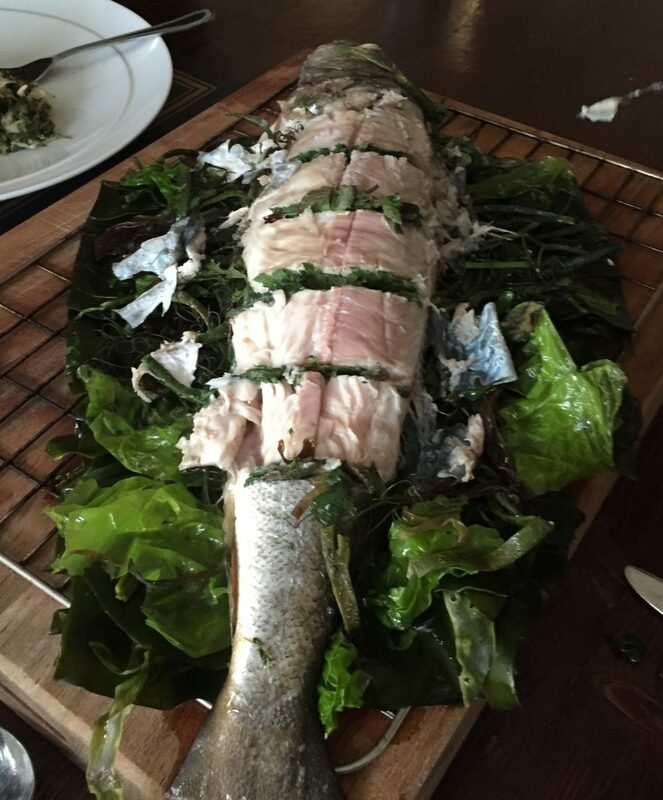 Also to my friend Craig Worral for a delicious bit of sous weed Islay pollack! 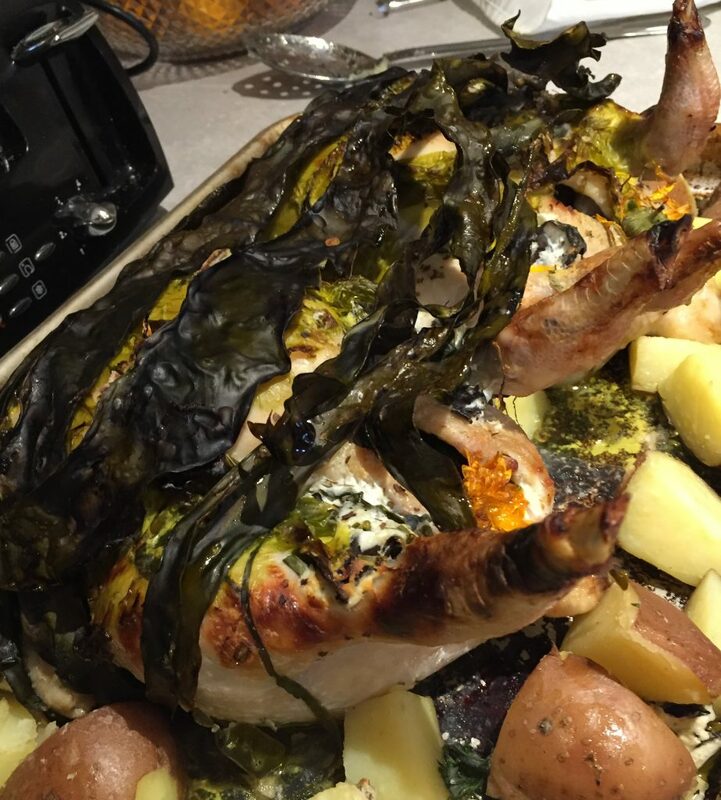 Home grown Lewis lamb (wedder) sous-weed with sugar kelp really raises it to another level! Thanks for the suggestion, it works brilliantly to enhance the flavour and also provides delicious sugar kelp crisps to go with it. A firm family favourite.